Obv: Bust of Peter the Great in armor and ermine mantle, beneath which is the ribbon of the Order of St. Andrew PETRUS ALEXIEWITZ TZAR MAG. RUSS. IMP. In 1717, Peter went to Paris where he visited the boy-king Louis XV and the Regent, the Duke of Orleans. 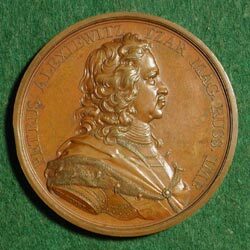 During that time Jean Du Vivier, the medallist of the Paris Mint, made sketches of the king and engraved the portrait die (the obverse of this medal). According to Spassky and Shchukina, although Du Vivier "failed to achieve any considerable physical likeness, the majestic and austere image of Peter created by him is extremely impressive". The legend depicts Peter as "Emperor", a title which is the highest ever borne by a sovereign and reflects the idea that Russia is one of the great powers of the world. 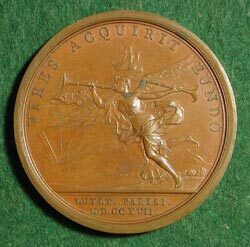 The reverse of this medal, which was done by Michael Roeg, evokes the words of Theophanes Prokopovich: "World fame is Peter's worthy herald."